What happens to Qualcomm Stadium? SAN DIEGO – What happens to Qualcomm Stadium and its 166-acre Mission Valley property if the San Diego Chargers move downtown or head north to Los Angeles in 2017? San Diego got a potential picture Tuesday when JMI Realty and Cisterra Development unveiled a proposal to turn the city-owned property into a second campus for San Diego State University. JMI CEO John Kratzer and a panel of business and community leaders released their plan at a news conference in a ballroom at SDSU’s Montezuma Hall. Vincent Mudd with Carrier Johnson + Culture, an architecture firm, presented basic renderings of the plan. It included a new 40,000 seat Aztec football stadium, student and faculty housing, new academic and research buildings and commercial space filled with businesses designed to support university life. Along with the stadium, there would also be an amphitheater for concerts, commencements and the like. A walkway would run in a near circle through the entire development. 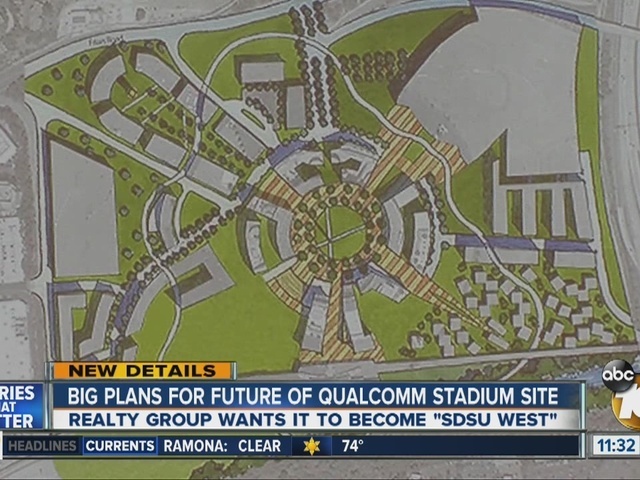 A circular commons area in the middle of the campus would mark the footprint of the demolished Qualcomm Stadium, in honor of the site’s history. The campus would have 67 acres of open space consisting of 28 acres of river conservancy and 39 acres of open space land. The plan did not provide any specifics for how it would be financed. However, former State Senator Steve Pearce, who was part of the panel, told the gathering that the city should bestow the land to SDSU. He noted that in 1964, the U.S. military donated the land on which the Camp Calvin Mathews military base sat in La Jolla to the University of California, San Diego. Pearce argued that the city would make more money long term by investing in a college campus than by selling the land to a developer. "We don't endorse this plan. This is their plan, their private thing. At this point, we're not working with any developers. We're not working with JMI, and we haven't endorsed any specific developer or plan." JMI was responsible for developing Petco Park and its surrounding district. JMI is owned by former Padres owner John Moores.